Are you keeping an old car that is not in a good working order? You may have experienced many beautiful moments with your beloved vehicle. But when it turns into a scrap or junk, it’s time to get rid of it as quickly as possible. This is the right option if your old vehicle has accumulated a level of disrepair that it is permanently broken down. However, the biggest question is how to get rid of a scrap vehicle quickly? After all, it is not simple to sell a wrecked and not-driveable car for cash. 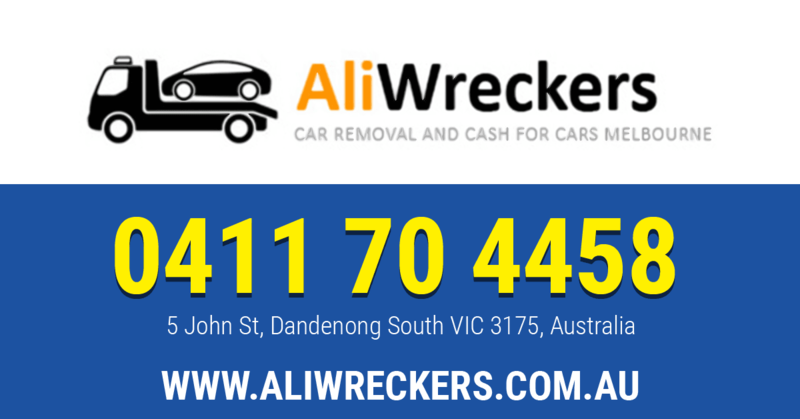 If you want to get the best price for your junk automobile in Melbourne, look no further than Ali Wreckers. Being a reputable car wrecking company, we have both the experience and knowledge to remove junk vehicles with ease. Continue reading to find out why Ali Wreckers are your best bet when it’s time to get rid of a damaged vehicle. What exactly make Ali Wreckers a reliable car removal company? Ali Wreckers have a specialised team of appraisers with excellent knowledge in the auto wrecking business. They make sure to carefully analyse the worth of every automobile using their best skills. That’s why they are able to share a precise assessment based on objective characteristics and other necessary details of the vehicle. According to it you can expect to receive a generous and fair cash offer for every kind of vehicle. The ultimate cash offer can go as much as $7’000. Basically, the car appraisers consider all such information as it’s make, model, odometer reading and the extent of damages. If you are interested to know the exact worth of your junk car, you can request for a free quote today. You only need to speak to their friendly representative using their phone number: 0411 70 4458. Or, you can submit their “get a quote” form to receive an instant quote. When it comes to selling a junk vehicle in private market it is normal to spend a huge dollars in its repair and fixes. You cannot expect to sell a scrap and broken down car in a very short period of time. It is understandable because most private buyers don’t like the idea of buying a car that already require expensive repairs. This is where it is best to sell your unwanted car to Ali Wreckers team. They will buy and remove it from your place in just one day. While you will also receive a handsome cash payment before saying goodbye to your old vehicle. The Ali Wreckers team removes unwanted vehicles without caring about the level of disrepair in it. The reliable and knowledgeable team at Ali Wreckers try their level best to provide fuss-free service to customers. This is why they are able to deal with all different makes and models of automobiles effectively. Whether your vehicle is a very old model or have a great demand in the market. You can without a doubt sell it to the Ali Wreckers team for top price. They will use their best skills to properly dispose and recycle every type of vehicle. Audi, Toyota, Daihatsu, Ford, Mazda, BMW, Lexus, Honda, Volkswagen, Renault, Hyundai, Subaru, Chrysler, Holden, Isuzu, BMW, Volvo, Jeep, Mitsubishi, Suzuki, Kia, Peugeot, Mercedes Benz, Fiat, and many more. At Ali Wreckers, the team focus on providing a car removal service which involves least possible hassle. You have to only get in touch with their team and they will arrange a free car removal from mentioned location. It could be in any part of Melbourne, the expert auto towers will quickly reach you to take away your old clunker. They do it for zero fees and no hidden deductions are made out of the cash payment. This allows customers to make more money out of scrapping their junk car. So you can sell you can get rid of your car quickly and earn the best money out of the process.